Charm is an advanced risk measure which indicates how much the delta changes with the passage of time. More specifically, the charm of a portfolio is how much its delta will change overnight, if all other parameters like volatility or base price remain the same. Negative charm means that the delta will decrease. 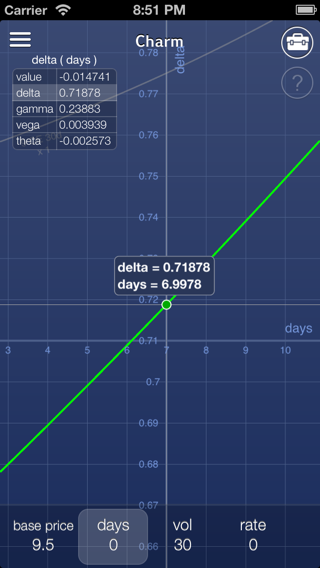 Charm is a very important measure if you keep a delta neutral position or need to stay within some limits on delta, since it will tell you what can become of your delta tomorrow. In this study you see how the delta of a call ratio changes with time, the difference in graph value between two consecutive days is the charm. See also greeks, delta, delta neutral, gamma.